Don't you just LOVE the "Flower Patch" set? And you don't even need the dies that go along with it. You can just stamp without them. Though I do love the dies too but for this card that I found I didn't. I do not know who the designer of this card is but if you do, please let me know so I can give them credit and a link back. You can view the original cards here. I was only going to make one card but when thought about it more, a pack of cards sounded like a great gift idea. SO I decided to make 5 cards since I needed one for my stash!! The card stock colors used here are Crisp Cantaloupe, Daffodil Delight, Pool Party, Wisteria Wonder and Whisper White. The inks are all the same colors with the following added, Pear Pizzazz, Lost Lagoon, Crushed Curry, and Tangerine Tango. The words were done using the black Memento ink. My new favorite black ink. I still like StazOn but this stuff washes off better. First you stamp the large flower, then the center, then the stem, and finally the words. These went so fast and now I'm wishing I would have made several sets because they went together so quickly. The word set I used for the top image is from the "Wetlands" set. The words on the bottom set are from my favorite "Sincere Salutations" set. It's got all the words you need for the front of your cards and they are the perfect size. I made a birthday, thinking of you, thank you, and a get well card. Oh and in the center of each flower is a rhinestone. 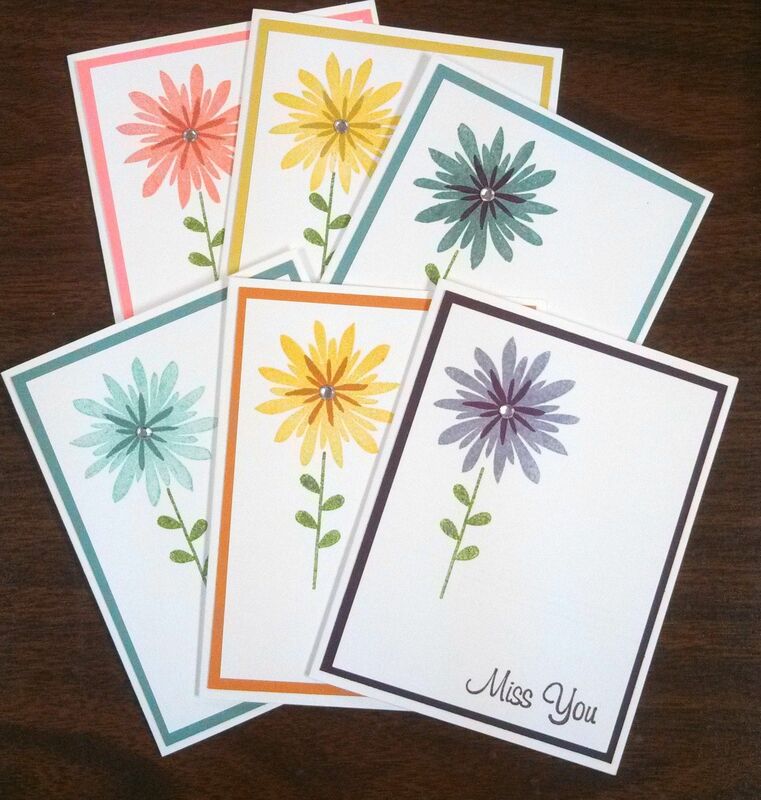 I just love these cards and they were SUPER easy and quick to make too! Now I'm going to box mine up in a clear box, wrap a ribbon around them and toss them in my box of stuff I'm selling at the fall craft fair!! !